She was welcomed into God’s kingdom on July 17th surrounded by her family. Elfrieda Lillian Frese (Pedercini) was born in Adams, MA to Gertrude Emma Pedercini (Schmidt) and Joseph J. Pedercini on December 22, 1925. She married Leonard Francis Frese June 15, 1946 at St. John’s Church in North Adams. She worked at Clark Biscuit in North Adams. She was a devoted wife, mother, sister, aunt, cousin and friend. She was predeceased by her son, Alfred Frese and her husband, Leonard Frese. She is survived by her sister, Janet Morton (Pedercini) of North Adams, MA and brother, Alfred Pedercini of Syracuse, NY along with several cousins, nieces and nephews. FUNERAL NOTICE: A funeral service to celebrate the life of Frieda Frese will take place on Monday, July 23, 2018 at 11:00am at the Flynn & Dagnoli Funeral Home – WEST Chapel, 521 West Main St., North Adams, MA 01247. Burial will follow in Southview Cemetery. Calling hours will be Monday morning from 9:00 AM until the time of the service. 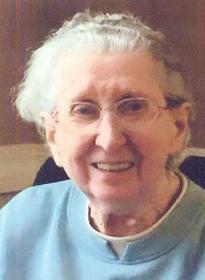 Donations may be made in her memory to All Saints Church of North Adams, MA or Hospice Care of the Berkshires. To add to the Book of Memories, please visit www.flynndagnolifuneralhomes.com.